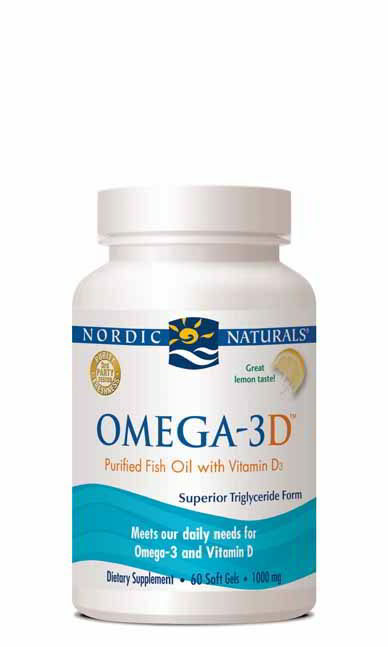 The same tasty, natural ratio omega formula as our Omega-3, Omega-3D is a pure, non-concentrated fish oil that provides the international recommendations of EPA+DHA in one serving, in addition to surpassing the recommended daily value for vitamin D for adults and children over four years of age. Vitamin D3 (or cholecalciferol) is the natural form of vitamin D produced by the body, and is better absorbed and utilized than other forms. Other Ingredients: purified deep sea fish oil (from anchovies and sardines), soft gel capsule (gelatin, water, glycerin, natural lemon flavor), natural lemon flavor, d-alpha tocopherol, vitamin D3 (cholecalciferol in olive oil), rosemary extract (a natural preservative). Store in a cool, dry place, away from sunlight. Do not take if tamper-evident seal is broken or missing. Consult with your physician before using this product if you are allergic to iodine, use blood thinners, or anticipate surgery. Keep out of reach of children.